The palettes you see at the left, right, and bottom of QuarkXPress are free floating — you can drag them anywhere that’s convenient for you. In contrast to the palettes, the menus in the menu bar are glued in place: You must always take your mouse up to the menu bar to access them. However, a context-sensitive subset of menu items is also available in the context menu that appears directly under your mouse pointer whenever you Control-click (Mac) or right-click (Windows) anywhere in QuarkXPress. You also encounter dialog boxes, which appear whenever you choose a menu item that has an ellipsis (…) after its name. For example, when you choose File→Open…, a dialog box appears that lets you navigate to a file to open, and if you choose File→Print. . ., a dialog box appears so that you can set your printing options. 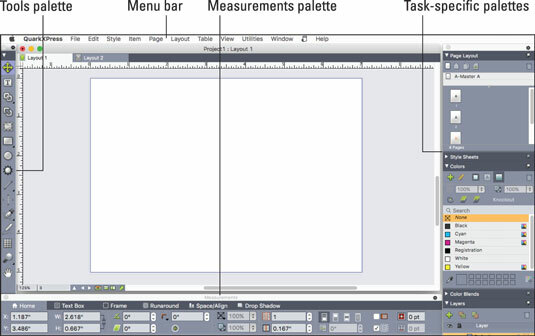 In QuarkXPress, each project may contain multiple layouts. Each layout may have a different size and orientation as well as a different output intent: print or digital.